The Anointing of the Sick offers prayers for possible recovery, but the more important intention is to give strength to the soul of the sick person. The Church believes that the sacrament offers a special grace to calm and strengthen the spirit. This can be of great comfort in time of illness. This sacrament has its origin based on St. James’ Epistle: “Are there any sick among you? Then let them send for the priests and let the priest pray over them, anointing them with oil” (James 4:14). When can I receive the Anointing of the Sick? You may ask to receive the sacrament any time you are to undergo surgery under general anesthetic and when you have a serious injury or illness. Advanced age may also be a sufficient reason too. You may receive this sacrament more than once. 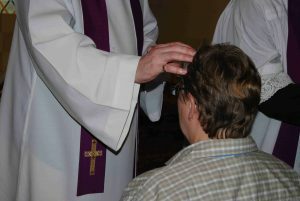 In fact, all Catholics of any age are encouraged to ask for this sacrament any time a new condition or surgery arises. Please contact the parish office to speak with a priest about receiving this sacrament. What are the “Last Rites”? This sacrament of Last Rites was called Extreme Unction (last anointing), not because it was the last sacrament a person received before he/she died, but because it was the last anointing that person received. Baptism and Confirmation are the first two times we are anointed. Many older Catholics are under the mistaken impression that they can only receive the sacrament on their death bed; quite literally “Last Rites”. This may have seemed true in years past, but with modern medical advances today improving our recovery from illness, this sacrament is rightly received by anyone suffering a serious injury or illness and can be received as often as needed.